Lately, I've been thinking a lot about how to effectively limit screen time for my toddler. We managed to keep his life screen-free for his first 12 months, but as he gets older, it's becoming increasingly difficult, especially now that he's more verbal about his wishes, strong-willed, and adept at manipulating electronic devices on his own (I'm not sure whether to be proud or embarrassed that he's mastered the Apple swipe!). The American Academy of Pediatrics recommends no screen time for children under 2 and less than 2 hours per day for older children; a challenging expectation given that we're parenting in an age in which we constantly encounter electronic media (TVs, smart phones, tablets, computers, gaming consoles, etc.) at home and in schools, libraries, waiting rooms, gyms, restaurants, etc. I want my kid to ultimately be technologically competent (and enjoy the benefits of technology) but I don't want him to be a couch potato. I decided to query the mom community; what I found was a range of interesting techniques that real families are using to manage screen time in their households. 1. Set a time limit. Many moms set a strict time limit for the use of electronic devices. Common limits mentioned were 30 minutes per day for infants/toddlers and 1-2 hours per day for the older set. 2. Designate specific times. Several moms indicated that their children were allowed access to electronics only during specific times, such as when parents are preparing dinner, when parents are sick, or when the family is traveling or eating out. 3. Limit to educational content. Many of the moms I talked to indicated that they only allowed their children to watch what they considered to be "educational programming" and only when they were watching with them, monitoring the content. 4. Go cold turkey. One mom reported that her family doesn't own a TV at all. AT ALL. When she and her husband want to watch a program, they use their computer after their little one has gone to bed. 5. Offer free reign. Several of the moms believe that the more they try to limit their kids, the more they seemed to want it so they do not have any rules. 6. Try a screen-free day. Some moms institute "screen-free days" in the hopes that their children will see that there is more to life than electronics and fun can be had in more active, constructive ways. 7. Use screen time as reward. Some admitted that although perhaps not advisable, they do use screen time as a reward for good behavior or good grades. 8. 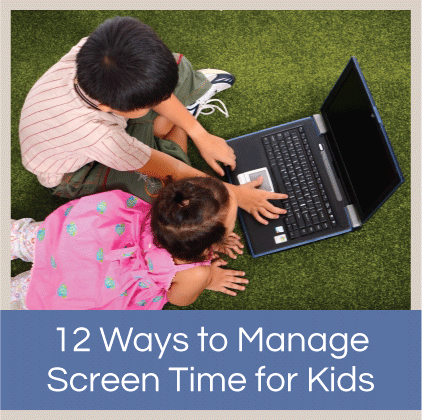 Make screen time contingent on other activities. One mom suggested the use of creative solutions such as equating screen time with chore time, exercise time, or outdoor time. 9. Make less screen time a game. One mom occasionally poses the following challenge: Who can watch the least amount of TV per week? Create a chart and tally up each family member's TV minutes at the end of the week. Whoever watches the least wins a special treat! 10. Change up the location. One mom reported that when they moved the TV out of the family room, her child requested less screen time. Apparently "out of sight, out of mind" applies to screen time, too, so it makes sense to try to keep TVs out of children's rooms and play areas as much as possible. 11. Stay busy. One mom, who noticed that her child only requested to use electronics when bored at home, made it a priority to fill their schedule with classes, play dates, and outings. Less idle time at home allows for fewer screen time opportunities. 12. Seek out alternative activities. One mom emphasized the importance of having equally enticing, novel play materials readily available at home so that her kids don't reach for the remote. Try hitting up the library for a great new book, exploring an easy craft, or taking advantage of free outdoor fun. Many of the moms indicated that they don't watch TV during their children's waking hours. If kids see us vegging on the couch, they're likely to want to do the same. We need to practice what we preach, right? How do you negotiate screen time with your kids? What types of screen time rules did you have when you were growing up?